European bison, Bison bonasus, in the Tarcu mountains nature reserve, Natura 2000 site, Southern Carpathians, Romania. 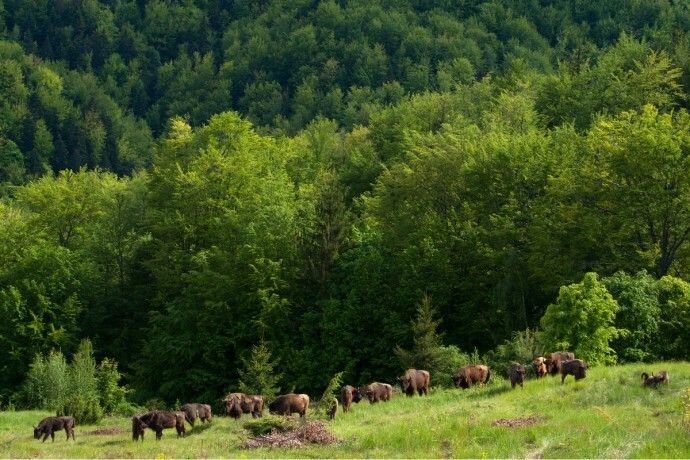 Already for several years, Rewilding Europe and WWF Romania are working together in the Southern Carpathians rewilding area with the aim to bring back European bison into its old habitats. In cooperation with the local community in Armeniş, authorities at local, regional and national level, and other stakeholders two bison releases have taken place in the Tarcu Mountains Natura 2000 site: the first first release took place in 2014 and the second release in 2015, bringing 28 bison to the area. Rewilding Europe and WWF Romania are also thrilled to announce the third release of European bison to take place in the Southern Carpathians rewilding area on 11 June 2016. This will bring us one step closer to our goal – building a viable population of at least 300 animals by 2024 (including offspring), consisting of different herds roaming the area and connecting with each other. Once released into this area, the animals will join the existing herds and graze with other herbivores. There are bears and wolves in the area, so the bison have to find their way in protecting themselves about these possible predators. This is part of allowing important ecological processes to take place. For this reason, Rewilding Europe is also working to increase the numbers of other wildlife species, in particular red deer and roe deer. 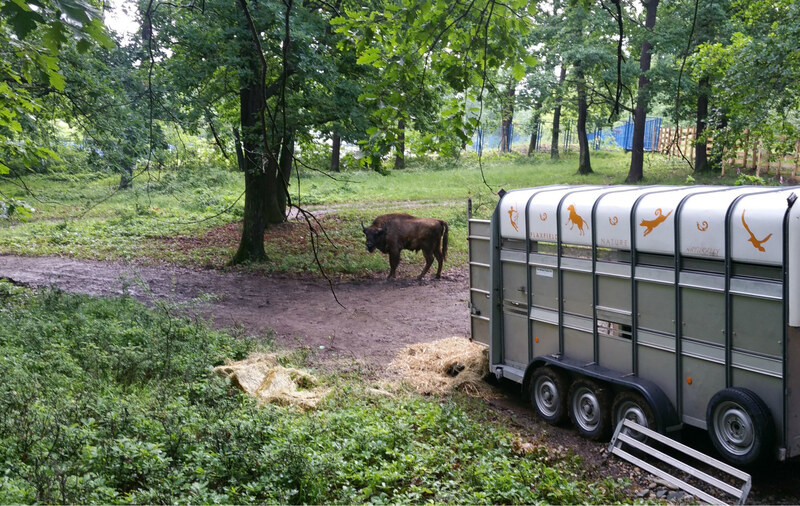 European bison arrived to the Hunedoara Bison Breeding Centre in Romania on 25 May 2016. To reduce the risk posed by relocations of young bison from thousands of kilometres away, Rewilding Europe, WWF Romania, Hunedoara Zoo and local authorities work together to start a bison breeding centre in Romania. This action is part of LIFE Project “Urgent actions for the recovery of European bison populations in Romania” financed by the European Commission through the Life programme. The first two bison, one male and one female, donated to the LIFE – Bison project by Bielefeld Zoo in Germany and Han sur Lesse (Grottes de Han) Wildlife Park in Belgium arrived safely last week to Hunedoara Zoo. The female was born in Wisentgehege Springe, bison reserve in Germany, and hosted in Belgium for over a year. Prior to their arrival, the Hunedoara zoo set up a 6000 square meter enclosure for the project. Zoos can have a direct involvement in saving endangered species from disappearing in the wild. The facilities and specialised personnel make zoos the obvious choice for a breeding centre. New born bison in Hunedoara Zoo breeding centre will, after reaching a certain age, be released in two release sites in the Southern Carpathians – Tarcu Mountains and Poiana Rusca Mountains. Over the coming years new animals from zoos and wildlife parks across Europe will be transported to Hunedoara to diversify the gene pool. The bison reintroduction in the Southern Carpathians is supported through the generous help of various zoos and wildlife parks throughout Europe, for which we are very grateful.